USES: This medication is used to treat certain mental/mood disorders (such as schizophrenia, psychotic disorders, manic phase of bipolar disorder, severe behavioral problems in children). Chlorpromazine helps you to think more clearly, feel less nervous, and take part in everyday life. It can reduce aggressive behavior and the desire to hurt yourself/others. It may also help to decrease hallucinations (hearing/seeing things that are not there). Chlorpromazine is a psychiatric medication that belongs to the class of drugs called phenothiazine antipsychotics. It works by helping to restore the balance of certain natural substances in the brain. Chlorpromazine is also used to control nausea/vomiting, relieve prolonged hiccups, relieve restlessness/anxiety before surgery, and help treat tetanus. HOW TO USE: Take this medication by mouth with or without food, usually 2-4 times daily or as directed by your doctor. Dosage is based on your medical condition, age, and response to treatment. In children, the dosage is also based on weight. To reduce your risk of side effects, your doctor may direct you to start this medication at a low dose and gradually increase your dose. Follow your doctor's instructions carefully. Take this medication regularly to get the most benefit from it. To help you remember, take it at the same times each day. Although you may notice some medication effects soon after starting, for some conditions, it may take several weeks before you get the full benefit of this drug. Do not stop taking this medication without consulting your doctor. Some conditions may become worse when this drug is suddenly stopped. Also, you may experience symptoms such as upset stomach, nausea, vomiting, dizziness, and shakiness. To prevent these symptoms while you are stopping treatment with this drug, your doctor may reduce your dose gradually. Consult your doctor or pharmacist for more details. Report any new or worsening symptoms immediately. Tell your doctor if your condition does not improve or if it worsens. SIDE EFFECTS: Drowsiness, dizziness, dry mouth, blurred vision, tiredness, nausea, constipation, weight gain, and trouble sleeping may occur. If any of these effects persist or worsen, tell your doctor or pharmacist promptly. To reduce the risk of dizziness and lightheadedness, get up slowly when rising from a sitting or lying position. This drug may cause muscle/nervous system problems (extrapyramidal symptoms-EPS). Your doctor may prescribe another medication to decrease these side effects. Tell your doctor immediately if you notice any of the following side effects: feelings of anxiety/agitation/jitteriness, drooling/trouble swallowing, restlessness/constant need to move, shaking (tremor), shuffling walk, stiff muscles, severe muscle spasms/cramping (such as twisting neck, arching back, eyes rolling up), mask-like expression of the face. Remember that your doctor has prescribed this medication because he or she has judged that the benefit to you is greater than the risk of side effects. Many people using this medication do not have serious side effects. Tell your doctor immediately if any of these unlikely but serious side effects occur: difficulty urinating, sunburn-like rash (sun sensitivity), decreased cough reflex, swelling of the feet/ankles, butterfly-shaped rash on nose and cheeks, joint/muscle pain, skin discoloration, eye/vision changes, feeling unusually cold or hot. Infrequently, this medication may cause face/muscle twitching and uncontrollable movements (tardive dyskinesia). In some cases, this condition may be permanent. Tell your doctor immediately if you develop any uncontrollable movements such as lip smacking, mouth puckering, tongue thrusting, chewing, or unusual arm/leg movements. In rare cases, chlorpromazine may increase your level of a certain chemical made by the body (prolactin). For females, this increase in prolactin may result in unwanted breast milk, missed/stopped periods, or difficulty becoming pregnant. For males, it may result in decreased sexual ability, inability to produce sperm, or enlarged breasts. If you develop any of these symptoms, tell your doctor immediately. Rarely, males may have a painful or prolonged erection lasting 4 or more hours. If this occurs, stop using this drug and seek immediate medical attention, or permanent problems could occur. Tell your doctor immediately if any of these rare but serious side effects occur: signs of liver problems (such as yellowing eyes/skin, dark urine, persistent nausea, vomiting, stomach/abdominal pain), signs of infection (such as fever, persistent sore throat), easy bruising/bleeding, signs of anemia (such as severe tiredness, fast breathing, pale skin, fast heartbeat), mental/mood changes (such as worsening psychosis, unresponsive/catatonic state). Seek immediate medical attention if any of these rare but serious side effects occur: severe dizziness, fainting, slowed breathing, fast/irregular heartbeat, chest pain, seizures. This drug may rarely cause a serious (sometimes fatal) nervous system problem (neuroleptic malignant syndrome-NMS). Seek immediate medical attention if you notice any of the following side effects: fever, stiff muscles, increased sweating, fast/irregular heartbeat, sudden mental/mood changes (such as confusion, loss of consciousness), change in the amount of urine. A very serious allergic reaction to this drug is rare. However, seek immediate medical attention if you notice any symptoms of a serious allergic reaction, including: rash, itching/swelling (especially of the face/tongue/throat), severe dizziness, trouble breathing. This is not a complete list of possible side effects. If you notice other effects not listed above, contact your doctor or pharmacist. In the US - Call your doctor for medical advice about side effects. You may report side effects to FDA at 1-800-FDA-1088. In Canada - Call your doctor for medical advice about side effects. You may report side effects to Health Canada at 1-866-234-2345. PRECAUTIONS: See also Warning section. Before taking chlorpromazine, tell your doctor or pharmacist if you are allergic to it; or to other phenothiazine drugs (such as perphenazine, thioridazine); or if you have any other allergies. This product may contain inactive ingredients, which can cause allergic reactions or other problems. Talk to your pharmacist for more details. This medication should not be used in a patient who is unconscious or intoxicated with alcohol/narcotics/other drugs that cause drowsiness/slowed breathing. Before using this medication, tell your doctor or pharmacist your medical history, especially of: liver problems, kidney problems, heart problems (such as mitral valve insufficiency, abnormal heart rhythm), low blood pressure, blockage of the intestines, glaucoma, seizures, enlarged prostate, breathing problems (such as severe asthma, emphysema, lung infections), blood disorders (such as bone marrow depression, low red/white/platelet blood cell counts), low levels of calcium in the blood, loss of too much body water (dehydration), breast cancer, brain disorder/tumor/injury, exposure to organophosphate insecticides, pheochromocytoma, drug/alcohol/substance abuse, Parkinson's disease. Chlorpromazine may cause a condition that affects the heart rhythm (QT prolongation). QT prolongation can infrequently result in serious (rarely fatal) fast/irregular heartbeat and other symptoms (such as severe dizziness, fainting) that require immediate medical attention. The risk of QT prolongation may be increased if you have certain medical conditions or are taking other drugs that may affect the heart rhythm (see also Drug Interactions section). 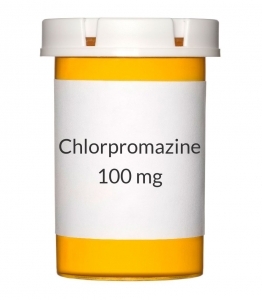 Before using chlorpromazine, tell your doctor or pharmacist if you have any of the following conditions: certain heart problems (heart failure, slow heartbeat, QT prolongation in the EKG), family history of certain heart problems (QT prolongation in the EKG, sudden cardiac death). Low levels of potassium or magnesium in the blood may also increase your risk of QT prolongation. This risk may increase if you use certain drugs (such as diuretics/"water pills") or if you have conditions such as severe sweating, diarrhea, or vomiting. Talk to your doctor about using chlorpromazine safely. This drug may make you dizzy or drowsy or cause blurred vision. Do not drive, use machinery, or do any activity that requires alertness or clear vision until you are sure you can perform such activities safely. Avoid alcoholic beverages. Before having surgery or imaging procedures (such as certain X-rays, CT scans) requiring the use of contrast dye (such as metrizamide), tell your doctor or dentist that you are using this medication and about all the products you use (including prescription drugs, nonprescription drugs, and herbal products). This medication may make you more sensitive to the sun. Avoid prolonged sun exposure, tanning booths, and sunlamps. Use a sunscreen and wear protective clothing when outdoors. This medication may decrease your ability to sweat, making you more likely to get heat stroke. Avoid activities that may cause you to overheat (such as doing strenuous work/exercise in hot weather, using hot tubs). When the weather is hot, drink plenty of fluids and dress lightly. If you become overheated, promptly seek cooler shelter and stop exercising. Seek immediate medical attention if you develop a fever, mental/mood changes, headache, or dizziness. Children with acute illnesses (such as a viral infection, dehydration) are at increased risk for serious muscle problems during chlorpromazine treatment. Consult the doctor for more details. Older adults may be more sensitive to the side effects of this drug, especially dizziness, drowsiness, uncontrollable movements, and anticholinergic effects (such as constipation, difficulty urinating, and blurred vision). During pregnancy, this medication should be used only when clearly needed. Discuss the risks and benefits with your doctor. Do not stop taking this medication unless directed by your doctor. Avoid use of chlorpromazine near the due date because it may cause low blood pressure in the mother. Babies born to mothers who have used this medication during pregnancy may rarely have liver problems with symptoms including yellowing of the eyes/skin or dark urine. If you notice liver problems in your infant, tell the doctor right away. When this drug is used during the last 3 months of pregnancy, babies born to these mothers may infrequently develop symptoms including muscle stiffness or shakiness, drowsiness, feeding/breathing difficulties, or constant crying. If you notice any of these symptoms in your newborn anytime during their first month, tell the doctor right away. This medication passes into breast milk and may have undesirable effects on a nursing infant. Consult your doctor before breast-feeding. DRUG INTERACTIONS: The effects of some drugs can change if you take other drugs or herbal products at the same time. This can increase your risk for serious side effects or may cause your medications not to work correctly. These drug interactions are possible, but do not always occur. Your doctor or pharmacist can often prevent or manage interactions by changing how you use your medications or by close monitoring. To help your doctor and pharmacist give you the best care, be sure to tell your doctor and pharmacist about all the products you use (including prescription drugs, nonprescription drugs, and herbal products) before starting treatment with this product. While using this product, do not start, stop, or change the dosage of any other medicines you are using without your doctor's approval. Some products that may interact with this drug include: alpha blockers (such as prazosin), anticholinergic/antispasmodic drugs (such as atropine, dicyclomine, scopolamine), drugs that increase the amount of dopamine in your body (such as cabergoline, levodopa, pergolide, ropinirole), guanethidine, warfarin. Other medications can affect the removal of chlorpromazine from your body, which may affect how chlorpromazine works. Examples include pindolol, propranolol, drugs to treat seizures (such as carbamazepine, phenobarbital, phenytoin), among others. Many drugs besides chlorpromazine may affect the heart rhythm (QT prolongation), including amiodarone, dofetilide, pimozide, procainamide, quinidine, sotalol, macrolide antibiotics (such as erythromycin), among others. Therefore, before using chlorpromazine, report all medications you are currently using to your doctor or pharmacist. Tell your doctor or pharmacist if you are taking other products that cause drowsiness or may slow your breathing including alcohol, antihistamines (such as cetirizine, diphenhydramine), drugs for sleep or anxiety (such as alprazolam, diazepam, zolpidem), muscle relaxants, and narcotic pain relievers (such as codeine). Check the labels on all your medicines (such as allergy or cough-and-cold products) because they may contain ingredients that cause drowsiness. Ask your pharmacist about using those products safely. Also report the use of drugs that might increase seizure risk when combined with chlorpromazine, such as bupropion, isoniazid (INH), theophylline, tramadol, or tricyclic antidepressants (such as amitriptyline), among others. Consult your doctor or pharmacist for details. This medication may interfere with certain laboratory tests (including certain pregnancy tests, phenylketonuria tests), possibly causing false test results. Make sure laboratory personnel and all your doctors know you use this drug. This document does not contain all possible drug interactions. Keep a list of all the products you use. Share this list with your doctor and pharmacist to lessen your risk for serious medication problems.